Tata Motors, India’s largest automobile company announced on 15th September 2015 that its global wholesales, including Jaguar Land Rover (JLR) rose 21% at 97,102 units in September 2015 over September 2014. This was good news for the automobile company after it reported flat global sales in June 2015. In order to pursue the company’s goal of becoming a considerable choice for customers buying decision, global expansion has faced a major challenge. The passenger vehicle segment, in which Tata Motors has a share of 5.72% (source: SIAM) so far has had a tough journey and been deprived of the ‘cool’ quotient. Even after an exciting year of aggressive marketing campaigns for its new generation products like Zest, Bolt and GenX Nano, Tata Motors wanted to take new strides in marketing its new product line-up inspired by its Horizonext strategy. To scale the oomph quotient and make a strong presence, the company signed up football star, four consecutive times Best Player of the World, Lionel Messi, in a long-term association as its global brand ambassador. He will promote and endorse its passenger vehicles, globally. In fact this is the first time ever that the Passenger Vehicle Business will be undertaking an overall brand association campaign with a brand ambassador. This association also means that Tata Motors becomes the first Indian brand to be endorsed by 28-year-old Messi, often considered the best player of the world and rated as the greatest of all time. Football is the most popular sport played in over 150 countries and Tata Motors has a presence in countries like Argentina, South Africa, UK, Thailand, and Spain among others. Roping in the best player of the game that is played almost across the globe seemed to be the rational choice. “We chose football because all our research and surveys prove that football is the new ‘cool’ and the current generation connects better with football. Soccer has a huge following in India and Messi is in a different league, making him the apt choice with his unique ability to appeal globally, transcending geographies, to represent our brand, internationally,” said Mayank Pareek, president, passenger vehicle business unit to ET. To begin with, the brand has launched ‘#madeofgreat’ campaign starring Lionel Messi. The campaign is based on consumer insight and rides on a strong consumer motivation of ‘Seeking Excellence’ & ‘Self Belief’ which is epitomized by the confluence of two global brands- Tata Motors and Lionel Messi. The core idea of ‘Made of Great’ emerges from the inspiring thought of ‘What drives us from within is what makes us great’. Except Messi fans, not many would know that the great footballer was diagnosed with a growth hormone deficiency as a child. He moved to Spain to join Barcelona and made his competitive debut aged 17 in October 2004. Despite being injury-prone during his early career, he established himself as an integral player for the club within the next three years, finishing 2007 as a finalist for both the Ballon d’Or and FIFA World Player of the Year award, a feat he repeated the following year. The rest is history for the great man of the game. Similarly, Tata Motors the world’s 17th-largest motor vehicle manufacturing company, fourth-largest truck manufacturer, and second-largest bus manufacturer by volume is driven by design, technology and strives towards excellence. “Through this powerful campaign we will communicate the values & ethos of the passenger vehicle business. As we look to expand our footprint across the globe, Messi’s unique ability to appeal globally, transcending geographies, makes him ideal person to represent our brand, internationally,” added Mayank. The campaign has been conceptualized by Ogilvy’s agency Soho Square, under the creative charge of the two executive creative directors Anuraag Khandelwal and Satish deSa who spent over five months on the making of this campaign. “This is a creative rendition that does complete justice in telling the Tata Motors story, and will resonate with Messi fans in India and across the globe,” adds Satish. Wizcraft is bringing this campaign alive on-ground, while DigitasLBi and SMG Convonix are seeding it across the digital platform, with Lodestar UM spearheading the media strategy. Social media platforms like Facebook have been busy creating buzz about the campaign a month prior. Apart from the usual countdown updates, the brand created a few videos named as “Tata Motors & Him” while keeping the humor quotient. To start with the brand roped in the popular stand up comedians from AIB. A 30-second video was created to keep fans guessing on who’s joining hands with Tata Motors. In another video we see Delna Avari, Head of Marketing, Tata Motors and Anuraag Khandelwal, ECD and Creative Head, Soho Square also talk about the Tata Motors & Him partnership while pouring in some funny dose. The final video talks about the top secret project and how the different teams worked to keep the secret by calling Lionel Messi as “Him”. The entire video shows the funny sides on how the agencies from Wizcraft to Soho Square to Digitas LBI tried different funny ways so that their secret is not revealed. At times it wasn’t really funny. 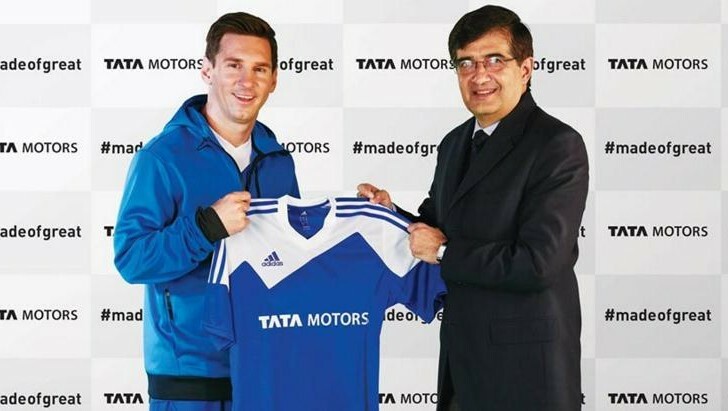 Tata Motors and Linoel Messi have started on the right foot. The campaign video could have been more human and have better storytelling. Messi dribbling with no real players around looks unreal to me. Nonetheless this is a beginning of the alliance and hopefully Tata Motors gets a spike on its global sales too.